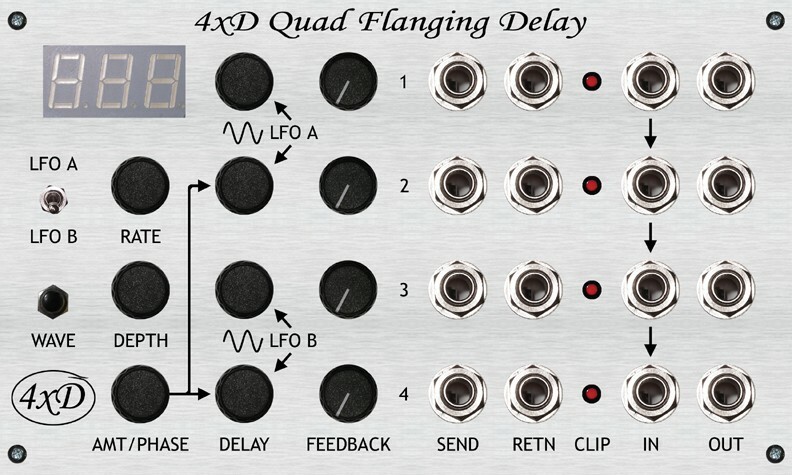 The 4xD started life because I wanted a number of simple, high quality, mono delays to create spatial effects for mix elements: the idea is that the original sound is panned hard left or right and a delayed version is panned to the opposite side. Typical delay times for this technique are between 3 and 50ms with the shorter times giving more subtle vertical positioning effects - allowing different elements in the mix to sit in separate spaces, and the longer times giving dramatic wide stereo effects. Of course I could have achieved this with a couple of off-the-shelf digital effects processors, but I wanted a hands-on box with a dedicated knob for each delay time and no layers of menus to scroll through! As I started to design this box, it became apparent that a number of other desirable functions could be achieved with pretty much the same hardware .. and so some more features got added - but all the time keeping to the principle that this should be a hands-on box with instant access to all parameters. I also aimed to have comprehensive analog I/O to allow modular-style configurability and insertion of external devices in the feedback loops. Analog feedback loop I/O to insert external EQ, filters, distortion, etc. The hardware design also lends itself well to general use as a lightweight audio-DSP platform. It uses 3 microcontrollers: 1 for UI and 2 for DSP, all of which have ICSP/ICD headers to allow programming and development with the assembled board. Since it is based on PIC chips the development software is free and the development tools are very inexpensive. All that is needed is Microchip MPLAB IDE software and an ICD2 compatible programmer/debugger. A company called Olimex do some good ICD2 clones: PIC-ICD2 at US$89.95 and PIC-TINY-ICD2 at US$49.95. If you are going to do a lot of development you'll probably want to get the more expensive one as the cheaper device (in common with other cheap ICD2 clones I've seen) communicates with the PC via RS232 (not USB) which can make it quite slow to program and debug. The 4xD code should make a good starting point for your own DSP projects: all the ground work such as the rotary encoder scanning, LED driving, inter-PIC SPI comms, CODEC I/O handling, etc. is there already. Just plug in the algorithms you want to play with..